One-stop shopping for all your foreign exchange needs. You can access our Foreign Currency Trading services through a wholly-owned subsidiary, Fidelity FOREX LLC. Fidelity Capital Markets' (FCM) Foreign Currency Trading offers convenient and efficient one-stop shopping for currencies and wire services. The Foreign Exchange Market (FOREX) is the largest financial market in the world. To help meet your investment objectives in this marketplace, you need to work with professionals who understand the advantages of the volatile currency market. When you work with Fidelity FOREX, you can take advantage of the insight and consultative strategies from our experienced professionals. You'll also enjoy a wide selection of available currencies and pricing that is both competitive and transparent. Access and direct transfer from Fidelity brokerage accounts. Global coverage tailored to help meet your foreign exchange needs. Weekly commentaries on the currency markets and world economies, offering you both fundamental and technical analysis of the global marketplace. Fidelity FOREX LLC, enables you to trade in an array of currencies. 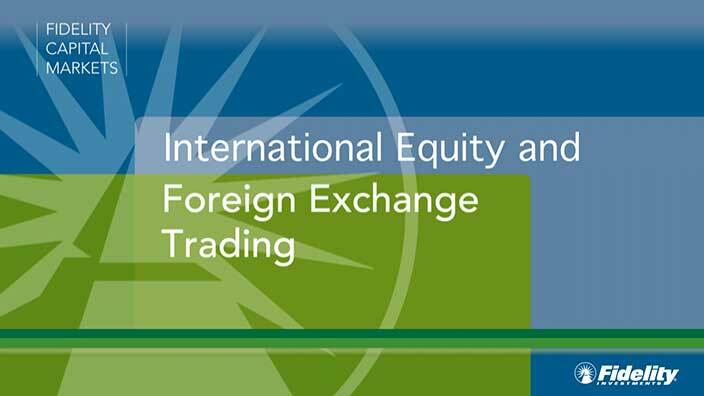 For more information on Foreign Currency Trading, contact a Fidelity Representative. * Fidelity unaudited data as of December 31, 2018.